Instructions: Make card from smooth white cardstock, then round the upper right corner. Ink the background stamp with three different ink colors, then stamp along the left side of the card. Stamp the smaller borders in an opposite color to the right of the first stamped image. Stamp the doily to the bottom of the stamped border. Diecut the banner from pink ledger paper, then stamp the sentiment to it. Adhere the sentiment banner coming from the doily middle, then accent with three paper flowers. 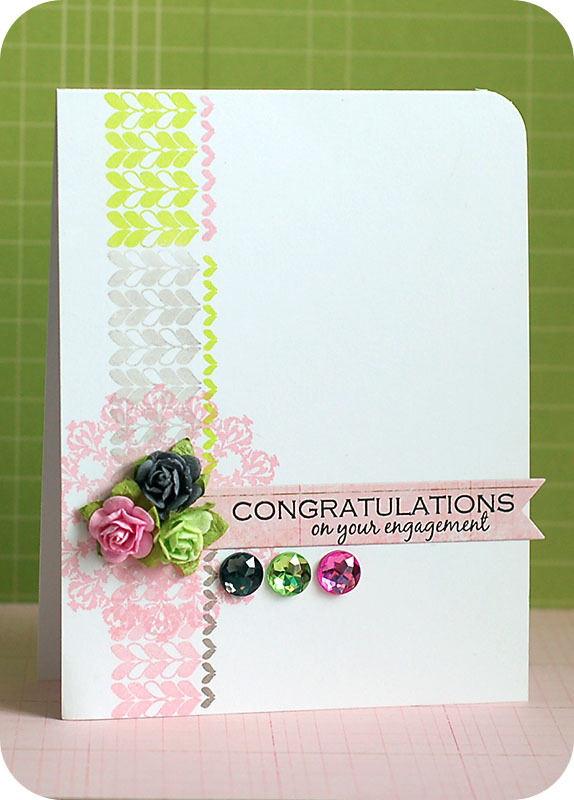 Add three matching jewels underneath the stamped sentiment banner to finish. Love the softness of the card! This is so elegant. Love those gorgeous gems and the look of the knitted hearts! Gorgeous card Lea. The colors are so pretty and I love the flowers and gems. Super cool and cute card, Lea! I love the bling and rosettes! Thanks for playing along in our Color Throwdown challenge this week! So pretty...love the use of the knit and doily stamps to create a border. Such a hip color combo and beautiful design, Lea!